Palo Alto is an area of California and the setting for a collection of short stories about high school students in the early 1990s. The stories focus on the every day lives of these students; from parties to dalliances with drugs and alcohol, from crushes to fights, it’s all here. Each story is told from the perspective of a different student, a student who might reappear in another of the stories, either as a main character or just in a fleeting one sentence passing remark. 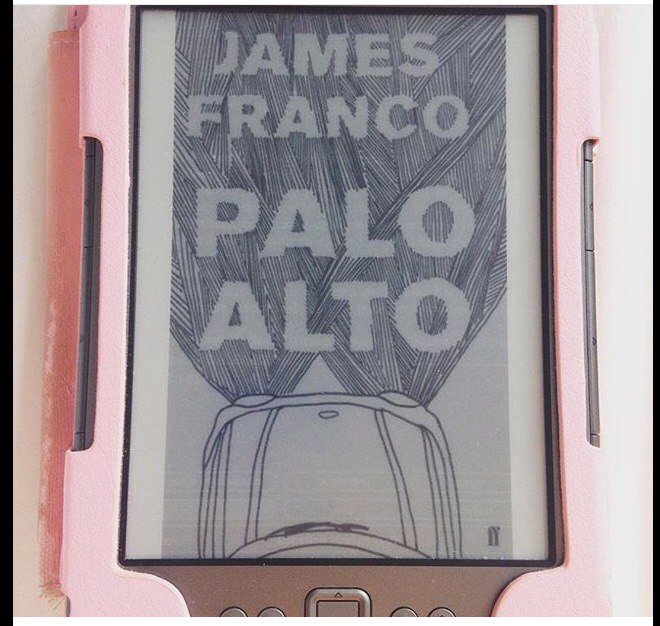 I have wanted to read Palo Alto ever since I watched the trailer for the film adaptation a few years ago (I still haven’t seen the film). 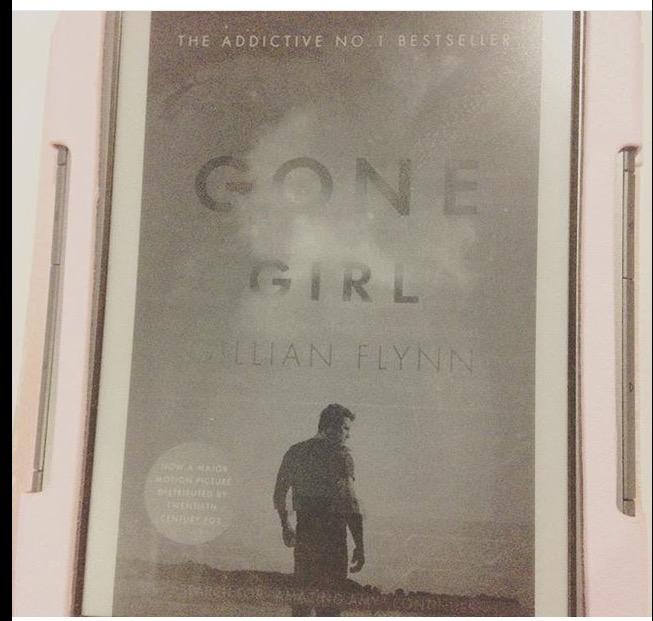 I randomly selected it from my kindle when I was in Berlin and loved it. I’m not a huge fan of short stories but I think because all of these stories were based in the same town, focused on similar characters and kind of linked I found this a really enjoyable read. It was fun remembering where a character had appeared before and sometimes they weren’t mentioned by name until later on in the story so you were almost guessing if the girl in this story was going to be X.
I think we are all a little guilty of judging books written by celebrities and almost passing them over as rubbish – or maybe I’m just talking about myself – but this is a book worth reading. Nothing incredibly big or overly exciting happens, which almost reflects the idea of being a teenager growing up in a town where not much happens. It’s a simple narrative and works perfectly as an insight into bored teenagers just experimenting and experiencing life. Nick and Amy have been married for five years and it hasn’t always been easy. From a glamorous life in New York they have had a fall from grace; after losing their jobs as writers, they have had to move back to Missouri and care for Nick’s dying parents. With no job prospects, they invest the last of Amy’s money – her parents wrote a collection of successful children’s books based on her – in a bar that Nick runs with his sister. And that’s about as exciting as life gets…until Amy disappears on the morning of their fifth wedding anniversary. There are signs of a struggle, cleared up blood and an interesting anniversary present ready to send Nick on his annual treasure hunt reliving some of the personal highlights of the year. It is a high profile case, especially as Amy is blonde, beautiful and kind of famous. In typical fashion it doesn’t take the police long to turn their suspicion towards Nick and the public follow suit. But is it as simple as man kills wife? The novel is told through a joint narrative of Nick and a diary written by Amy. They both have a very different take on events, so it can be tough for a reader to decide who to believe. It is clear that neither party is particularly happily in love. I like this style of narrative as I like the cliffhangers on the end of each chapter that keep me wanting to read more. I can’t say I warmed to either character, but if I had to pick I would choose Nick; Amy was just too irritating. I’m trying to write this review without any spoilers, so I will tell you that I loved it and was gripped all the way through. I wanted to find out more and I loved that little bits of information and secrets about the characters were slowly being revealed throughout. And then I got to the end! To say I was disappointed is an understatement. I didn’t like the ending one bit. It happened far too abruptly and in my eyes didn’t seem true to the characters or how they should react. For me it gave a bit of a ‘you can act in this way and still get what you want’ kind of vibe and I hate that and I just didn’t understand why the characters would do what they did. It’s a shame as I loved the book up until then and I don’t usually write negative reviews, but I wasn’t impressed. A Room of One’s Own is an extended essay by Virginia Woolf based on a lecture she gave at Girton College, Cambridge in 1928. In it she explores the life of women and fiction: how they have been portrayed; the struggles they have faced when writing; their style of writing and what they need in order to be a successful writer. Woolf discusses famous nineteenth century writers, such as Charlotte Bronte and Jane Austen, and their writing and goes on to discuss what would have happened if Shakespeare had a sister. As I type this my mind instantly turns to characters like Lady Macbeth. If your only knowledge of women came from this character alone, you would certainly think women ruled the world and that their husbands were there to do their bidding. Obviously she doesn’t have a happy ending, but she does persuade her husband to commit murder so she is a formidable woman. Ruth Kettering’s marriage is in trouble. Her husband has been spotted with a dancer of dubious reputation and Ruth has had enough. Her millionaire father is pushing her towards a divorce, even though Ruth has been far from perfect herself. Ruth needs a break and so she sets off for the continent on The Blue Train, taking with her some rare, precious and HUGE rubies that her father has bought her to cheer her up. It is no great surprise that Ruth is later found bludgeoned to death in her train carriage and the rubies are missing. Enter Hercule Poirot. 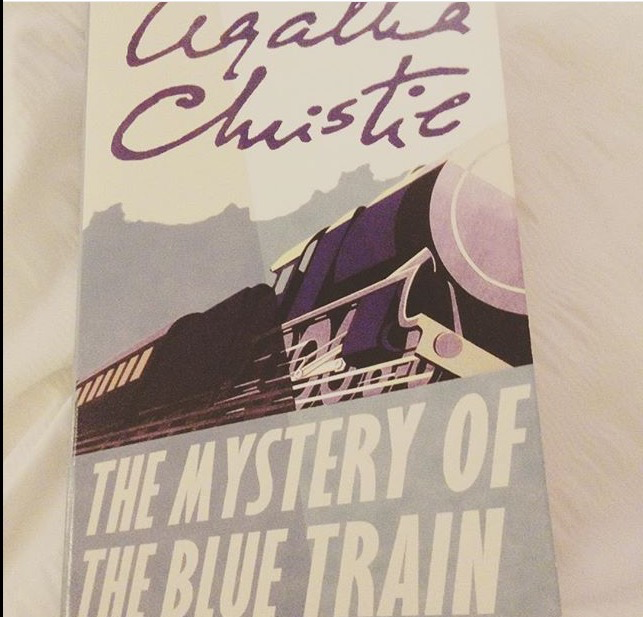 I always harp on about my love for Agatha Chrisite and I have a mini mission to read all of the Poirot novels and I am slowly making my way through them. As with most novels, it takes a while for Poirot to actually appear; first we are treated to some background information on the rubies (it is clear lots of people are eager to own them) and information about the marriage of our main character. We meet Miss Katherine Grey, who has recently come into money and meets Ruth on the train before her death. Katherine becomes like a mini sidekick to Poirot and helps him to solve this crime and provides a different focus for the story as we see how she feels about her recent money and the family who are so eager to be her friends now she is rich. I liked that she came from the village of St Mary’s Mead, which if I am right is where Miss Marple lives. As with most Poirot novels there are many potential suspect: the bitter husband (who gains £2million upon his wife’s death); her old flame; the maid and maybe just plain, old train robbers. I was convinced I had figured it out, but as usual I was wrong and the real criminal was revealed with me thinking ‘oh yeah…’ But this is what I love about crime fiction and Christie in general, it’s easy reading, but I still have to use my brain. 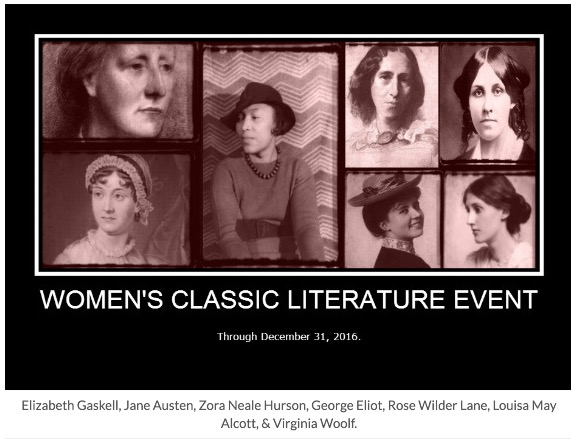 The Women’s Classic Literature Event was recently announced by The Classics Club and it is an event that celebrates women writer’s dating pre 1960. The event runs from now right until 31st December 2016 and although I have no set list, I am keen to see how many books I naturally choose to read in that time. I don’t know if Agatha Chrisite would qualify for the event in everyone’s eyes but she certainly does for me and therefore she is the first book on /author on my list and I doubt this will be the last time she appears. I am going to keep a track of the books for this event on a separate page at the top of my blog and I am sure the list will begin to grow fairly quickly. I have decided to join The Classics Club Women’s Classic Literature Event and below is the survey about the event and my responses. Introduce yourself. Tell us what you are most looking forward to in this event. I’m Linda and I have been blogging at LindyLit for just over three years. I joined The Classics Club way back when it first started and after taking a mini break from blogging over the summer I am keen to get back into some events. I’m looking forward to this event as there aren’t any real pressures to read a certain amount by a certain date and because I know I naturally read a few women’s classics but it will be good to have this event to spur me on to tick a few more women off my list. I’m also looking forward to seeing the women I read or aren’t on my original list. Have you read many classics by women? Why or why not? I have read quite a few classics by women (Jane Austen, Charlotte Bronte, Virginia Woolf) largely because I have studied them at sixth form and university and then been inspired to visit more of their works in my own time. I also have a huge love for Agatha Christie and Persephone Books and I know I will definitely read books from these two over the course of the next year. Pick a classic female writer you can’t wait to read for the event, & list her date of birth, her place of birth, and the title of one of her most famous works. I think I am most looking forward to revisiting some of Virginia Woolf’s work. I read a fair amount of it at university and I think a reread is long overdue. 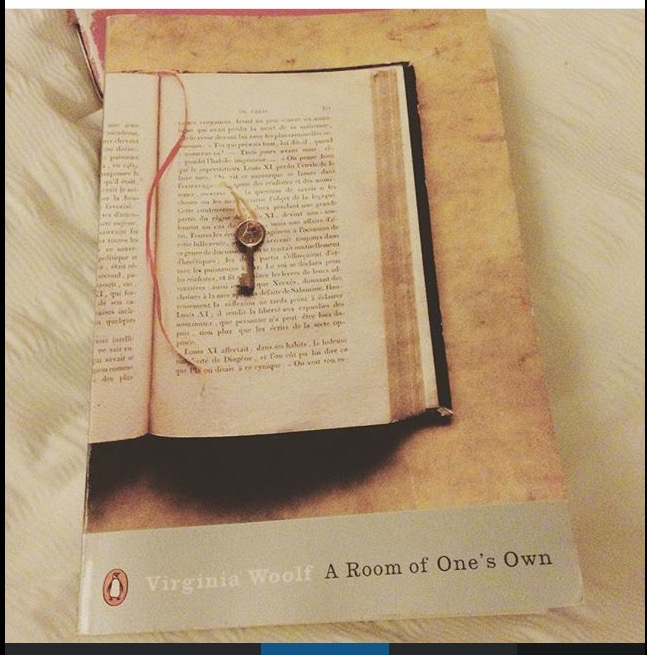 Woolf was born in England in 1882 and perhaps one of her most famous works is A Room of One’s Own. Think of a female character who was represented in classic literature by a male writer. Does she seem to be a whole or complete woman? Why or why not? Tell us about her. (Without spoilers, please!). Without a doubt I’m going to say Tess from Tess of the D’Urbervilles by Thomas Hardy. I love Hardy and I love Tess. To me she is a complete woman, yes some of the things that happen to her are a tad unrealistic (surely no woman could go through all that and survive) but she copes and in my eyes she is presented as a strong and determined woman. Even if she is a little bit constrained by Victorian morals. Favorite classic heroine? (Why? Who wrote her?). I would go for Tess (see above) or maybe Miss Marple by Agatha Christie as I love a detective novel and I think we can all relate to a somewhat nosey and meddlesome old lady who sticks her nose into other people’s business and helps solve crimes…or maybe it is just because I live in a little English village and have a fair few old, nosey ladies (quite harmless) in my family that I can relate. We’d love to help clubbers find great titles by classic female authors. Can you recommend any sources for building a list? (Just skip this question if you don’t have any at this point.). Definitely Agatha Christie or go to straight to the Persephone Books website. Will you be joining us for this event immediately, or will you wait until the new year starts? As I am currently reading an Agatha Christie it would seem foolish not to start straight away and I’m intrigued to see how many books by classic women writers I will read over the next year and a bit. Do you plan to read as inspiration pulls, or will you make out a preset list? I’m going to just read as inspiration pulls as I never really stick to reading lists. I would like to aim for at least three books by female authors from my classics club list but that is the only real ‘list’ I’ll stick to. Are you pulling to any particular genres? (Letters, journals, biographies, short stories, novels, poems, essays, etc?). Again, I’m not really leaning towards any genres so I shall just see where my reading takes me. Are you pulling to a particular era or location in literature by women? My main era will probably be the early half of the twentieth century as it is an era I love reading about and I know I will naturally gravitate toward that era. I tend to stay in England with a lot of my literature so maybe I might lush myself and go elsewhere. Do you hope to host an event or readalong for the group? No worries if you don’t have details. We’re just curious! I have never hosted a Readalong and don’t really have any plans to at the moment, but that might change in time so who knows. Is there an author or title you’d love to read with a group or a buddy for this event? Sharing may inspire someone to offer. I am always keen to read other people’s views on Agatha Christie or Persephone Books so I shall be looking out for posts on these two areas, but I don’t think I’ll be reading anything as a group. Share a quote you love by a classic female author — even if you haven’t read the book yet. As I established at work in the week, I am rubbish at remembering quotations so maybe I will leave this one as ‘yet to be completed’ and go from there. Roald Dahl is arguably one of the most famous children’s authors of all time; I have yet to meet a person who hasn’t heard of one of his books. Film makers have adapted some of his works into brilliant films (Willy Wonka and the Chocolate Factory, The Witches, Fantastic Mr. Fox) and even the West End has taken inspiration with popular musicals such as Matilda and Charlie and the Chocolate Factory. Boy is Roald Dahl’s autobiography – although he states in the opening pages it is NOT an autobiography as they are usually dull and boring – detailing his childhood in the 1920s/1930s. From evil sweet shop owners to wicked headmasters with canes, from family trips to Norway, boarding school horror tales to a magical trip in a motor car that almost resulted in the loss of a nose, Boy has everything an exciting autobiography for children needs. I can remember reading Boy at school, especially Dahl’s magical descriptions of Norway and ever since then I have longed to visit the country Dahl knew and loved so much. The details of his trips there inspired my own wishes to see and travel the fjords, in fact I must sort myself out and book a trip there soon. And over ten years I still get this feeling when I read Boy. Dahl’s writing is so timeless and he really did have the knack of drawing the reader in and simply telling a good tale. Reading Boy fills me with a sense of nostalgia and I always leave it wishing I had grown up in the idyllic time that Dahl describes, although he does make it clear that this era in history isn’t as perfect as it seems and I am sure in reality I would have hated it. 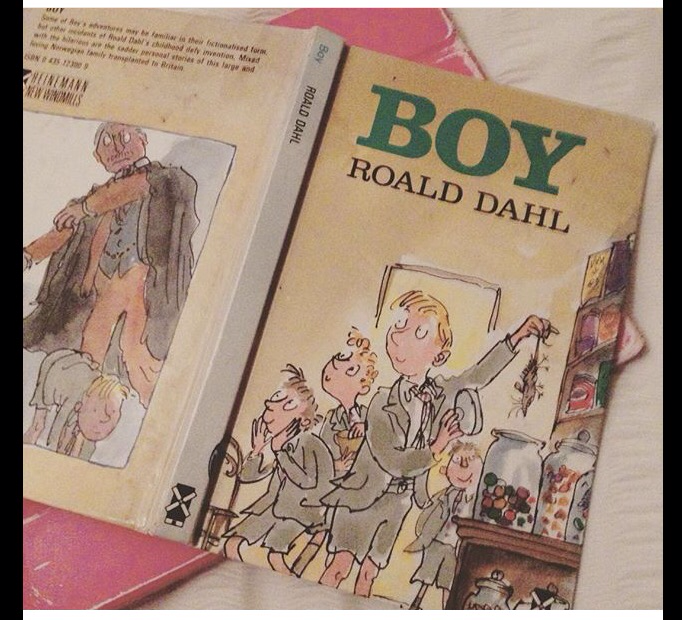 After my reread of Boy I am keen to return to more of Dahl’s books and the mischievous tales I remember from my own childhood. However I think I am going to begin my travels through Dahl’s writing with one I haven’t read before: Going Solo Dahl’s second autobiography, picking up where Boy finishes when Dahl is 18. Starting before The American Civil War Gone with the Wind is an epic novel spanning the war and the years following it. The entire novel focuses on Scarlett O’Hara, who begins as a vain and incredibly self obsessed sixteen year old and ends the novel as a slightly less vain and self obsessed woman in her late twenties. I say ‘slightly less’ as these (along with money hungry) are probably some of the best adjectives to describe Scarlett. That being said she is also fierce, strong willed and absolutely determined to succeed at everything she wants and this is what she does. Along the way she faces many hardships, especially as the defeat of the Confederate Army brings about the loss of the world she grew up in; a world where old families on their plantations ruled the South and women were brought up to be ladies. She sees those she grew up with killed fighting for a cause she cares very little for, she loses those she cares about, buries two husbands and recklessly ruins her relationship with the third, she is dirt poor, starving and has to defend her family home from Yankees. She becomes a business woman, much to the disgust of the families she grew up with. She realises that maybe lusting after and wasting her life wishing for a man she can never have may have jepordised her chance for real love and this is probably one of the hardest things for her to learn. I’m not going to pretend that my thoughts are going to bring about some wonderful new insight into this enormous novel or that I am going to offer anything profoundly interesting to say, but I am going to type up my jumbled thoughts and my own experience of reading Gone with the Wind. I feel as though I started this novel in a different lifetime; I bought it in Australia and began reading it on the plane home. Since then I have returned to work, restarted yoga and the gym, attended a hen party and a wedding, been on a mini trip to Cornwall and grown a year older (*sob*) so you can see how my thoughts might be a tad mixed up. Before starting Gone with the Wind I knew very little about it: I knew about Scarlett O’Hara; the setting of the American South; the ‘frankly my dear I don’t give a damn’ film line. That’s it. My knowledge of America during this time period is also very limited so it was very interesting to learn more about this period in American history and how Atlanta and the neighbouring area coped with such a tumultuous time and all the changes this brought about. 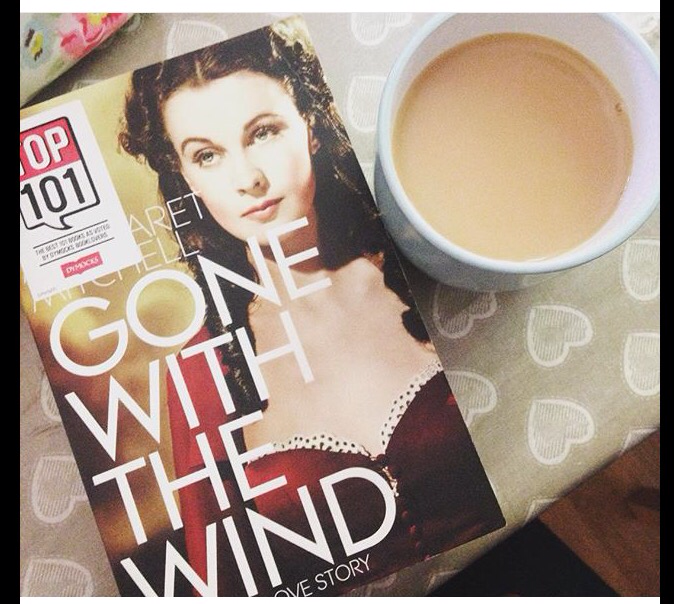 I did really enjoy Gone with the Wind and I was so keen to finish it. I loved Scarlett as a character as she is so strong minded and determined to get what she wants. There were times when she frustrated me, when she couldn’t see the good in people or accept that some people (Ashley) just aren’t going to change or live up to the ideal you have in your head. And there were times when her behaviour was to be admired, such as when she refused to lose her childhood home, Tara to the Yankees. Scarlett is certainly a formidable woman and I love how she was willing to break with conventions regardless of what other people thought. This would have been truly shocking for a woman in the 1860s and I loved how she just didn’t care. My limited prior knowledge of Gone with the Wind did go as far as knowing that Rhett Butler is one of Scarlett’s love interests. Therefore I was expecting some sweeping romance and a happy ever after. How wrong was I? Rhett is a perfect hero as he is a bit of a scoundrel but he isn’t afraid to call Scarlett out on her behaviour and to put her in her place. He also won’t stand for any of her nonsense or any nonsense from the people around him. I can’t believe how long the build up to their relationship was but it was clear throughout that something about Scarlett kept drawing Rhett back to her. As mentioned their romance does not have the typical happy ever after we expect. 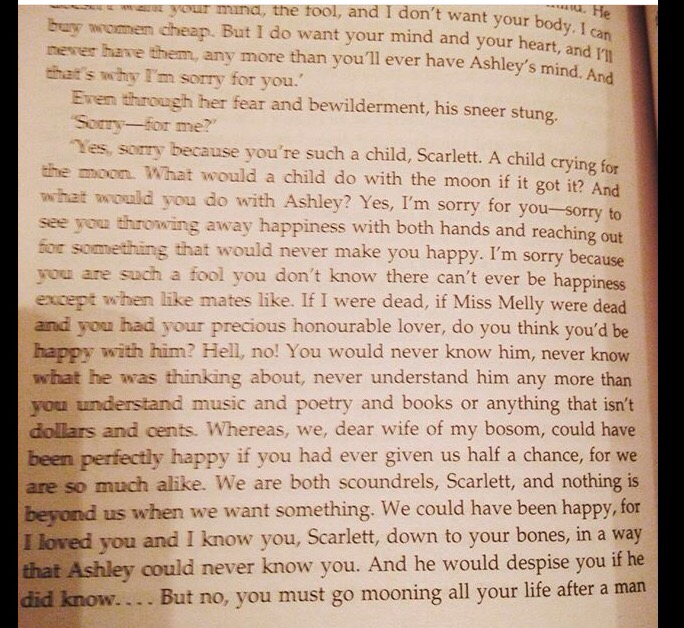 In fact Rhett leaves Scarlett just as she realises how much he means to her, thus leaving the reader in a somewhat ambiguous position as to what truly happens to Scarlett in the end. I have no doubts that Scarlett gets her way in the end and rekindles her relationship with Rhett, but the unclear ending is frustrating. Overall, despite the fact it took me forever to read I really enjoyed Gone with the Wind and I can see it will be a book I return to in a few years time and one I am sure you discover new things about each time you re read it. I think I would like to read around this novel before a reread as I am sure there is so much I have missed.